This line is open, except between Dalry and Kilmarnock, and a short section in Troon. The line was extended from Kilmarnock to Old Cumnock to meet a line approaching from Carlisle. The line formed the core of what was later to become the Glasgow and South Western Railway. Busy day at Falkland Yard. The line runs through the Ayrshire coalfield and farming countryside. Between Irvine and Ayr the line runs down the Ayrshire coastline. The line between Ardrossan and Kilwinning and on to Doura opened before this railway. It replaced tramways and was intended to be built between Ardrossan and Johnstone to join the Glasgow and Paisley Canal.The line was not completed and was absorbed by the Glasgow, Paisley, Kilmarnock and Ayr Railway which used the old line as a branch to Ardossan. From Ayr to Paisley with a line from Dalry to Kilmarnock. A Joint line with the Glasgow, Paisley and Greenock Railway continued to Glasgow. The line was extended south from Kilmarnock to meet the Glasgow, Dumfries and Carlisle Railway. This is a four platform station in Paisley. At the west end of the station was Stoneybrae signalbox, where the Glasgow, Paisley and Greenock Railway and the Glasgow, Paisley, Kilmanrock and Ayr Railway physically divide having run from Glasgow as the Glasgow and Paisley Joint Railwa. The Greenock route turns north west and the Kilmarnock and Ayr route turns south west. The junction between the two lines is actually to the east of the station at Wallneuk Junction. Originally the station had two platforms and a high wooden signal box (and the junction was to the west of the station). It was re-built as a four platform station and the glazed canopies have more recently been replaced with less attractive canopies. This was a west facing junction to the immediate east of Elderslie station. Here the Paisley Canal line joined the main line. A new station has been opened at Howwood. This station is slightly to the south west of the original Howwood station. The new one has two platforms and an extensive carpark. The station is a joint effort with a contractor building houses in the area. This station was called Lochwinnoch until the opening of the Kilbarchan Loop, and the opening of a new station much closer to the town of Lochwinnoch, when it was renamed Lochside. On closure of that loop, the station became Lochwinnoch again. Today the station has two platforms and a large carpark. The line was quadruple track between Brownhill Junction and Kilwinning with a branch to coal mines at Swinlees. This works is served by a branch which joins the main line at a north facing junction. The works keeps a shunter of its own. The station had four platforms (two island platforms), but has been re-built and now has two. Just to the north and east of the station were the Blair Iron works which had rail access. This was the junction between the lines from Glasgow to Kilmarnock and Ayr. The line from here to Kilmanrock is closed and lifted. Part of a water tank plinth remains. 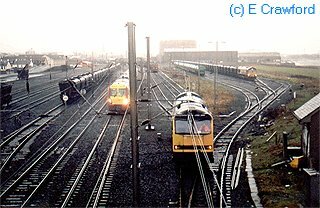 This is a north facing junction with many sidings, called Falkland Yard, on either side of the former Ayr and Dalmellington Railway which continues south to the present Ayr station and on to Stranraer. The sidings here are busy with coal traffic, much of it working to the harbour, and other trip workings. This is a north facing junction. To the south lines ran to the harbour (still open), to Ayr (Old) (closed) and to the present Ayr station (formerly Ayr Townhead). Sidings still run to Ayr Harbour from Falkland Yard. The course of these sidings, in the harbour, was at one time followed by one of the Ayr Waggonways on its approach to the habour. Today the harbour is approached from Falkland Yard (a north facing junction) and from Newton Junction with the former Ayr and Dalmellington Railway, just south of Newton-on-Ayr station. These two approaches meet at Ayr Harbour Junction and run to a quayside (in use for coal) and scrapyard (out of use). The connection from Newton Junction to Ayr Harbour Junction once crossed the line running south to Ayr (Old) on the level. This was the original terminus in Ayr. It was replaced by Ayr Townhead on its expansion. Little remains of the station today. To the south the line was extended on a bridge over the river to a quayside in the south of Ayr Harbour. The piers of this bridge remain. After closure as a passenger station the old Ayr station became a goods yard. Nothing remains of this quayside line to the south of the river except the pier of the bridge by which it swept, on a curve, over the river from Ayr (Old) station. This station had four platforms, two platforms on either side of the lines to Dalry and Irvine. Both routes are closed and the station site is partly landscaped although the goods shed still stood on my last visit. The station served a small number of nearby houses and farms. This south east facing junction between the Irvine and Kilmarnock Line and the main-line was just to the south east of Crosshouse station. Slightly further south east from the former junction is a buffer stop on a very long, and poor condition, siding which runs out from Kilmarnock. To the north of Kilmarnock station was a junction for the lines to Troon and Barrhead. Both of these lines remain open, but the original main line between here and Dalry is closed and lifted. The line from here running to Troon is a newer connecting line that the original Kilmarnock and Troon Railway which is met by the newer line a little to the west. The original terminus building of the line still stood at the north of the station in the late 1980s, to the west of the railway. To the south of the station the line crosses a large viaduct. The station had sixplatforms; two bays at the north end (still in use) a bay at the south end (disused) a main northbound platform, a main southbound platform on an island with a further platform on the other side. Between the two main platforms there were four tracks (the northbound non-stop line has now been lifted, but the southbound one remains). This station was at the junction of the original Kilmarnock-Cumnock alignment and the later Ayr and Mauchline Branch (Glasgow and South Western Railway) which met it at a south-east facing junction. The station was also the terminus for the trains to Catrine down the short branch to that town.